On an IFR flight yesterday in the Bonanza, I had to do some creative knob-twisting on the GNS530W to comply with an unusual clearance from Seattle Center. 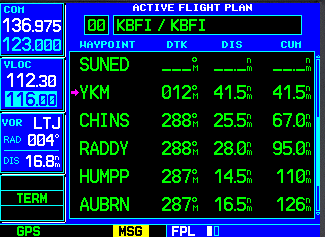 The process showed the value of using the Flight Plan page on the GNS530W and understanding how to use the menu options available on that page (viz., the distinction between going direct to a waypoint and activating a leg between waypoints in the list). I was VFR, about 40 miles south of YKM on a direct leg from DSD (chart here), when I called center to pick up the IFR clearance for a flight plan I’d filed to KBFI before departing KBDN. As usual, I had filed overhead YKM then V298 into the Seattle area, but center came through with a shortcut: YKM V4 CHINS CHINS6. In some 30 years of IFR flying in the Pacific Northwest, I’ve never been assigned the CHINS6 arrival (or its predecessors), because that’s a heavily traveled highway that lies atop V4 and busy arrival/departure routes serving KSEA. The planes I typically fly fly go low and slow, and center usually puts us putt-putt airplanes on V298 where we won’t hold up the fast-movers. I accepted the clearance immediately—it shaved a few miles off the planned route—dug out the chart for the CHINS6 STAR, and started the process of entering it into the GNS530W. But I was surprised to discover that the only entry points for the arrival in the GNS530W are EPH, IMB, and PDT. Yakima (YKM) wasn’t an option. There isn’t any way (that I know of) to load the arrival without selecting a transition, so I had to improvise. First, I switched the autopilot from NAV to HDG mode to keep the airplane from taking an unplanned detour when I loaded the arrival. This step isn’t strictly necessary, especially with STARs, but I’ve adopted it to avoid “What’s it doing now?” moments that can follow a major change in a flight plan or instrument approach procedure. Next, I chose the PDT transition as the most logical “starting” point given my position, and I loaded the arrival so that it was appended to the end of the active flight plan. This step added several legs well east of my cleared route to the map view of the GPS navigator. 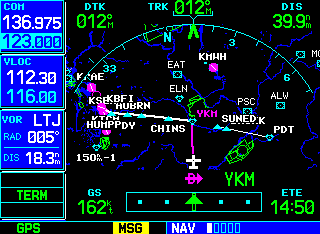 Finally, I opened the Flight Plan page and scrolled through the waypoints on the CHINS6 arrival, selected YKM as the active waypoint, chose direct-to, and put the autopilot back in NAV mode to proceed direct to YKM. A few minutes later, Chinook Approach cleared me direct to CHINS, cutting the corner short of YKM, so I repeated the above process to make CHINS the active direct-to waypoint. At CHINS, as expected, the GNS530W sequenced to the next waypoint in the arrival (RADDY) and the rest of the flight proceeded normally. Light-plane pilots often don’t fly STARs, except, perhaps, when heading for especially busy airports that handle a large volume of general-aviation traffic. But this example illustrates why it pays to understand key features of your GPS beyond direct-to—even if you don’t make frequent use of SIDs, STARs, or, for that matter, detailed flight plans (routes). Microsoft has released a teaser for the successor to Flight Simulator. Little information is available at present, but the short video is pretty. Excerpts from the press release below. COLOGNE, Germany — Aug. 17, 2009 — On the eve of gamescom 2010, the world’s largest consumer-oriented games showcase, Microsoft Corp. … announced the development of “Microsoft Flight,” a new entry inspired by the best-selling “Microsoft Flight Simulator” franchise. Published by Microsoft Game Studios, these new titles, along with the previously announced “Fable III,” fully integrate the free* Games for Windows – LIVE online service to deliver compelling socially connected gameplay experiences. …Additional information, screenshots and trailers are available at the Microsoft gamescom press site at http://xbox.com/en-GB/press.